Both beautiful and practical, Aesop’s ethos is all about marrying old world wisdom with new tech disciplines – harnessing the finest botanical extracts and fusing them with the latest and greatest scientific discoveries. The bottles are made of traditional amber glass (or in this case, sustainable plastic), to protect against UV degradation and prolong the integrity of their specialist blends (whilst minimising the need for preservatives). Not only does this aromatic hand cream smell beyond divine, it also softens and protects skin with its beautiful blend of natural oils and extracts. 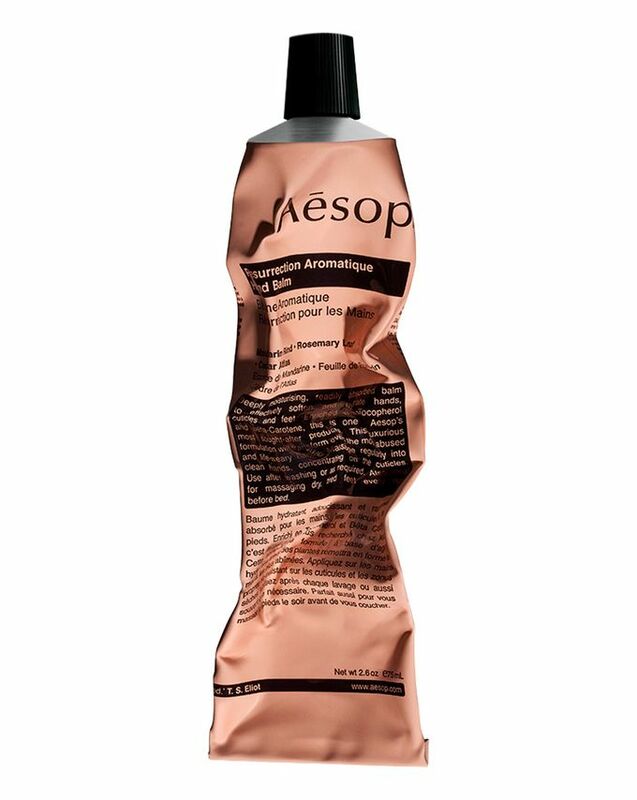 This classic Aesop hand lotion not only sinks in quickly without making your hands greasy and unusable (anyone with a slightly difficult bathroom door knob knows the potential hand cream dangers). It smells beautifully of Mandarin oil, Rosemary Leaf and Cedarwood and works well with the Resurrection hand wash. This moisturiser softens rough skin, cuticles and nails and can be used all over the body, especially for a foot massage... anyone? Aesop don’t believe in ‘anti’ – you won’t see any hyperbolic ‘anti-ageing’ or ‘anti-acne’ claims – instead, their products are developed to complement a balanced lifestyle, and help protect against the elements. This is ‘pro’ skin care for those who’re planning to grow older gracefully, proud of the skin that they live in. Use this hand cream whenever your hands feel dry or just after washing them to keep them looking and feeling in tip top condition. Water (Aqua), Glycerin, Prunus Amygdalus Dulcis (Sweet Almond Oil), Stearic Acid, Cetearyl Alcohol, Cetereath-20, Cocoa Nucifera (Coconut) Oil, Macadamica Ternofolia Seed Oil, d'Limonene, Citrus Nobilis (Mandarin Orange) Peel Oil, Glyceryl Stearate, Cedrus Atlantica (Cedarwood) Bark Oil, Lavandula Angustifolia (Lavender) Oil, Tocopherol, Aloe Barbedensis Leaf Juice, Butyrospermum Parkii (Shea Butter), Theobroma Cacao (Cocoa) Seed Butter, Citrus Aurantium Dulcis (Orange) Oil, Phenoxyethanol, Linalool, Rosmarinus Officianalis (Rosemary) Leaf Oil, Citrus Grandis (Grapefruit) Seed Extract, Triticum Vulgare (Wheat) Germ Oil, Glycine Soja (Soybean), Disodium EDTA, Citral Geraniol, Daucus Carota Sativa (Carrot) Root Extract, Courmarin, Beta-Carotene. Pros: It moisturizes and sinks into the skin. Cons: A bit stinky (I'm very used to essential oils but it smelled a bit rank). Didn't last long and way too expensive given it didn't make my hands extraordinarily soft. So impressed with this hand cream. I was sceptical of the price so bought the smaller size and was pleasantly surprised by how large the tube was, I know this will last me ages. It smells incredible and leaves my hands very soft. I do have very dry hands and this has really helped. Not greasy at all, luxurious feeling and quite a fast drying too - highly recommend! No one really needs to spend nearly £20 on a hand cream but I'm very glad I did. Smells amazing, soaks in quickly and is just a little bit of daily luxury when I use it. I received this today and I absolutely love the smell and it is not greasy and leaves my skin feeling so soft. Will be trying more things from this brand without a doubt. Smells amazing and feels great on the skin! It doesn’t feel thick or greasy. It leaves your skin looking hydrated, but not oily like some moistureisers. I have dry and sensitive skin and efinitely would recommend for anyone with either or both problems. This hand cream has a really relaxing smell. Besides, it’s also quite moisturizing for the hands. Love it! Hands down the best hand cream! And I’ve tried plenty. It smells absolutely wonderful and has kind of like forest scent to it. If you are thinking about buying and are not sure because of the price I say go for it! It will be worth it. It will not leave your hands greasy and dries quickly. I bought this hand cream in the hope that it wouldn't leave my hands feeling greasy afterwards. I was not disappointed as the cream soaked straight in and smelled divine. Even my work colleague's asked who had sprayed perfume and when I said it was my hand cream they all wanted to try it and I still have a full tube. 100% worth the 5-star rating. This is my first time when I tried some product for hand care and was really impressed. This is definitely unique because after using this you feel well balanced, soft and just healthy skin, but at the same, it absorbs instantly and you couldn't even remember that you applied something into your hands a few seconds ago. An amazing treatment especially for a winter.